The perfect ingredient for a black and white image is color. One of the things that I truly love about the desert is the way the topography plays with the light. This is especially true at the beginning and the end of the day when the sun is low in the sky making the shadows longer and the colors more varied. At mid-day the landscape is stark, nearly blinding, and seems almost monochromatic at times as if the sun has simply bleached all color from the earth. As night approaches the story changes and the land begins to act as a kaleidoscope and seems to twist and scatter the light in wholly different and unique ways each time. These first two images were taken just as the sun was setting. Monument Valley had disappeared into shadow and the only remaining sunlight hitting the tops of these massive buttes. As the sun set behind me the valley and sky developed these beautiful deep blue tones while the sunset bathed the monolithic stone in a wonderfully contrasting orange glow. As day faded to night I noticed the local Navajo tour guides ferrying their passengers back to the visitor center and knew that the light trail would help carve the contours of the valley floor from the darkness quite nicely. Several hours later I attempted another shot as the moon rose over the distant ridge. 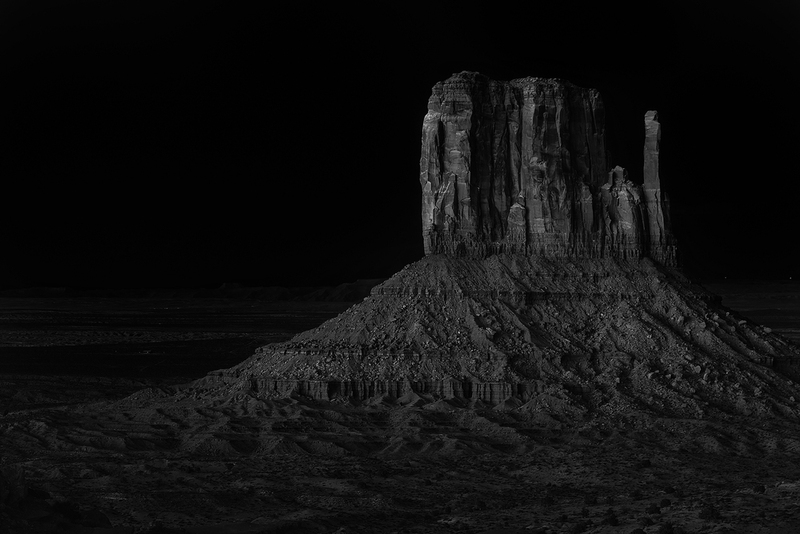 Monument Valley is dark. It is really, really dark so when the moon rises it is surprisingly bright. The moonlight washes out the sky but it also illuminates the landscape in a stark white light. When shooting moonlit landscapes getting the color right is a bit more subjective than normal because our eyes work differently at night. The outdoor scene looks bluish because in low light situations we lose sensitivity to green and red colors. If I shot a grey card and calibrated your color in the more conventional way this image would look a lot warmer (and almost like daylight) but it wouldn't look like it did when I shot it in person. The scene looked pretty bright once the moon made its appearance because my night vision had fully kicked in and then the area was flooded with light. The crazy part is that the moon really didn't give off that much light and this exposure took over 18 minutes to make which is shy the you can see the star trails in the background. My final two images were captured as the sun rose. These shots are both handblended hdr images. This method allowed me to explore the depth of colors in the sky and reveal the detail on the shadow side of the buttes without bringing out too much noise which is always a danger when you push a digital file too far. I had a lot of fun watching how the look and feel of Monument Valley slowly changed over the course of 11 hours. Watching the deep blues fad away to reveal a blanket of stars which then warmed up to an explosion of oranges and yellows was something to see. It isn't very often that I'm able to sit around and photograph one spot (and especially one like this) for half a day and study how the light is moving across the landscape but maybe I ought to make the effort more often. What a fantastic trip around Arizona! There are a lot of new images to share with you but I'll start in Monument Valley for now. This was my second visit to the iconic area located along the Arizona - Utah border and I was determined to make the most of it. When I revisit an area or a building for a second (or third or fourth) time I strive to make new photographs. I may utilize some similar vantage points (whether by choice or necessity) but I want the images to look and feel different from what I shot before. While that is not always possible it is always my goal. Unfortunately on this trip I wasn't able to book a private sunset or camping tour which meant I was going to be pretty isolated to the standard (yet still quite amazing) view from the visitor's center. This happened to be the case on my first visit as well. As we arrived in the middle of the afternoon I was a bit disappointed since the conditions were nearly identical to my first visit and less than appealing. I had hoped for some clouds to add some drama to the skies but when we arrived there wasn't a cloud to be seen for miles. My best hope for a photo would be for the sky to pop as the sun set. As luck would have it the visitor's center is located on a small cliff overlooking the valley itself. I knew that as the sun sets to the west the cliff's shadow would slowly creep across the valley floor and swallow the towering buttes. I hoped that some of the dust kicking around would help bring some color to the scene. I started shooting from this spot about an hour before the sun went down. I loved the long shadows the buttes and mesas were casting but I kept hoping for more color to arrive. My patience was finally rewarded about 3 minutes before the sun dipped below the horizon. As the last light kissed the tops of the monuments, the valley turned dark, and the sky finally popped. I love the ways the pink sky play against the blue hues of the valley and the way the orange stone really pops. It was a lesson once again to never give up on a sunset. These colors lasted for less than 2 minutes but because of planing and persistence I captured the shot I was looking for. Having fun at the beach on a cold day. 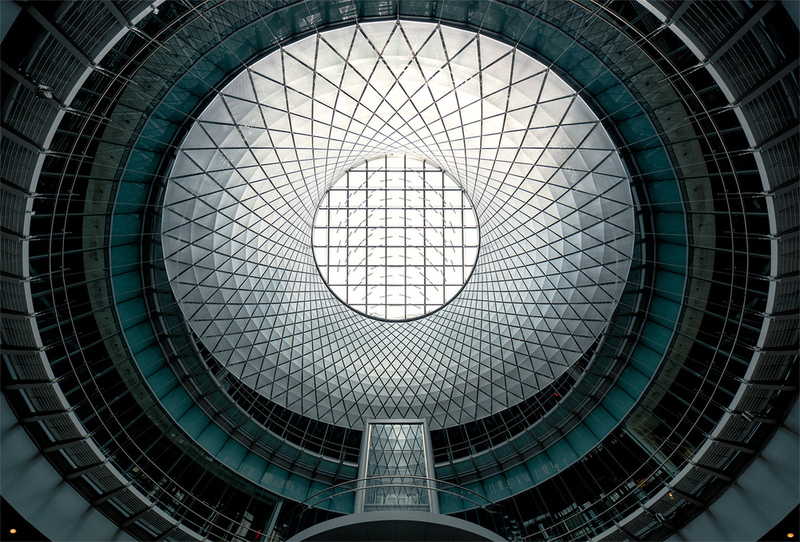 Despite its modern design New York's Fulton Center employs a pre-WW2 design motif.